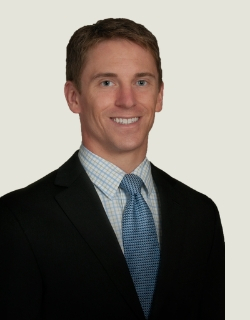 Dr. Michael Hood is a board-certified ophthalmologist and vitreoretinal surgeon. He spent his childhood years in Oklahoma City and attended Bishop McGuinness Catholic High School. Later, he received a Bachelor of Science in Zoology Biomedical Sciences from the University of Oklahoma. During this time, he was a member of the Phi Beta Kappa Honor Society, was named an Outstanding Zoology Senior, and graduated with special distinction. Dr. Hood attended medical school at the University of Oklahoma and was elected into the Alpha Omega Alpha Honor Society. While in medical school, Dr. Hood became fascinated with the medical and surgical management of ocular diseases and decided to pursue a residency in ophthalmology. After graduating medical school, he completed his internship at Riverside Regional hospital in Virginia, and then began his ophthalmology residency at the University of Tennessee. During his final year of residency, Dr. Hood served as a chief resident and far surpassed the clinical and surgical requirements for residency that have been established by the American Academy of Ophthalmology. After residency, Dr. Hood completed a two-year vitreoretinal surgery fellowship in Memphis, TN with the world-renowned Dr. Steve Charles, who developed many of the surgical techniques and devices used today, and who is considered to be one of the most influential people in modern vitreoretinal surgery. While attending possibly the busiest surgical vitreoretinal fellowship in the United States, Dr. Hood was exposed to a wide variety of pathologies and had extensive clinical and surgical training. During this time, he was appointed to a clinical faculty position at the University of Tennessee, where he enjoyed playing an active role in the teaching and training of residents. Dr. Hood has multiple publications in the peer-reviewed literature and has presented his research at several national meetings. He has a special interest in retinal detachment surgery, macular surgery, diabetic retinopathy, and macular degeneration. He also continues his research interests by being a co-investigator in several national clinical trials at RVC. In his free time, Dr. Hood enjoys staying active, rooting for the Thunder, and spending time with his wife and son. Dr. Hood is excited to be back in his hometown, and is honored to take care of his fellow Oklahomans.